This is to respectfully request that you review the following information and provide me with a determination if a recent news report by a member of the ABC News Medical Unit is in compliance with ABC News editorial standards and guidelines. Also, for an item I’m reporting on my blog, I’d appreciate your answers to some quick related questions. ...Eating red and processed meat is unhealthy for you and the planet. ...Dr. Robin Ortiz is a physician in internal medicine and pediatrics and a member of the ABC News Medical Unit. Dr. Ortiz is a longtime vegan and actively promotes a vegan diet on her website and via social media. For the past five years Dr. Ortiz has been a member of the Physicians Committee for Responsible Medicine (PCRM), a high-profile Washington, DC-based activist nonprofit that aggressively promotes a vegan diet. 1) None of the above information was included in Dr. Ortiz’s ABC report. Should any of the information have been included? If so, which parts? 2) Was the story assigned to Dr. Ortiz or did she suggest it? 3) Did any PRCM representatives assist Dr. Ortiz in her reporting? 4) Recenty I blogged an item compiling published mainstream sources that describe PCRM as an "animal rights" group. Whether or not Dr. Ortiz agrees with that, since she has been a member of the organization for five years, it stands to reason she’s aware of that description. Should her ABC report have included that information? 5) When politely asked to provide the names of editorial superiors, are reporters for ABC News encouraged to provide that information? Full disclosure, I’ve been a public critic of PCRM and Dr. Barnard re: their problematic 30-year relationship with my father, the late Henry J. Heimlich MD, known for his namesake anti-choking maneuver. The Exam Room™ is the ultimate vegan podcast from the Physicians Committee (for Responsible Medicine). Dr. Neal Barnard, a real-life rock star and authority on plant-based living, motivates and inspires the vegan-curious and those who have been plant-powered for life. Learn the secrets to radically improving your health as show host “The Weight Loss Champion” Chuck Carroll, who lost 265 pounds and kept it off, goes one-on-one with others who have transformed their lives. Also, on the show, you’ll hear from someone at the forefront of the future of nutrition and medicine. Robin Ortiz, M.D., brings her passion and infectious energy to The Exam Room™ to talk about her transformation from a semi-rebellious teenager to a doctor with a keen eye for all things plant-based. She gives her thoughts on the lack of nutrition education in medical school and talks about being viewed as a “hippy doc” by her colleagues because of her diet. But Dr. Ortiz’s endless supply of optimism and an increasing amount of research is proving that she’s on the right track. Mr. Carroll’s interview with Dr. Ortiz starts at timestamp 20:30. (21:00) Chuck Carroll: (Dr. Robin Ortiz) is the future of plant-based medicine…She will be a featured speaker at (PCRM’s) international conference on nutrition and medicine at some point in her career. (22:00) CC: This is the Exam Rood podcast brought to you by the Physicians Committee (for Responsible Medicine)...We have one of those future plant-based rock stars...She’s just wrapping up a rotation upstairs at the Barnard Medical Center (BMC). With that we welcome to the program Dr. Robin Ortiz...How’s it been upstairs? This is your final day as we’re taping and I’m sorry. I know we’re gonna miss you. Dr. Robin Ortiz: I’m gonna miss you guys more than probably most rotations I’ve been on. CC: How was it? I would assume biasedly that it’s lived up to expectations? RO: “Lived up to expectations” would be an understatement for sure. So my expectations coming in were I’ve been plant-based myself for quite some time. I know the nutrition, I know the gurus out there like the wonderful Dr. (Neal) Barnard)…I’m coming here to learn a little extra about specific nutritional resources or references. A little bit of information to take home and maybe convince a colleague or two. But I think I’m leaving with a whole new toolbox that I didn’t even know existed which is how to actually help patients understand and I jokingly use the metaphor “digest,” with pun intended, the information that’s out there and take all of the overwhelming amounts of nutritional information that we hear about all the time and simplify it. And I’ve learned a whole new way to do that. And I think no book or video or lecture or conference can teach you that, the way you can when you see patients one on one with dieticians or physicians or MPs or in the various classes that are taught here. It’s a whole other layer of learning that it’s insane that we don’t get that. (36:25) CC: We’re going to have you speaking at ICNM, our big conference here. [PCRM’s annual International Conference on Nutrition in Medicine.] It’s gonna happen. I hope you realize that. (44:00) RO: (My medical colleagues) know me as the hippie that advocates for plant-based nutrition. (45:50) RO: I hope that I will now being armed with the knowledge of this rotation (at BMC) be able to move forward (my advocacy of a plant-based diet)...I will get out there and spread the message. (47:00) CC: You can be a rock star. You can be a rock star. Last thing because I think somebody might be listening to this and say, “Hey, well you know what, I am a medical student or “Hey, I’m a resident -- I might be interested in coming doing a rotation at BMC. So you how did you stumble across this? 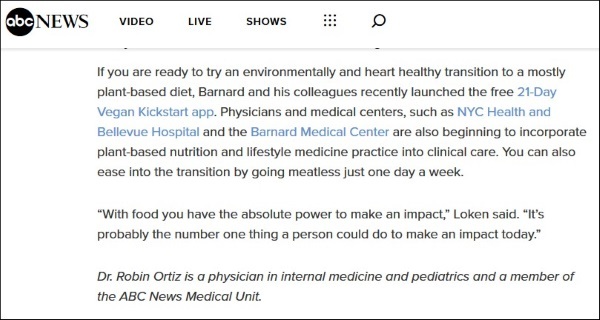 (48:30) RO: The Barnard Medical Center I came across because as long-standing in plant-based nutrition, I’ve long-followed PCRM. I was a student member and I went to the Veg Fests in DC and Baltimore before it was the cool thing to be a vegan so you might call me a hipster. No, but I went and heard a speaker at the time who – I’m also terrible with names but – somebody who I think was from PCRM or a related organization and (I) was talking to someone on the sidelines about an up and coming medical center that Dr. Barnard was thinking of opening so we’re talking about five years ago -- this was maybe when I was earlier in training. I had – my ears perked and I said I gotta be on the lookout for this. So I was already following the organization, but then I think it was by nature of social media or something that I actually saw the center open three years ago and I was in residency at the time and I just knew that in some way I was going to reach out and do something and then here I am fourth year when I have a lot more elective time and just went ahead and made the elective happen and had my organization agree to let me come. And although I owed them one or two shifts in clinic, that paid off because I got to go take back to my patients what I’m learning here, so awesome! And you know I had reached out to the department here with my application and it worked out timing-wise, and here I am and it was just amazing. I walk out on day one and Dr. Loomis [James Loomis Jr. MD] is standing there and, y’know I’d just seen Game Changers* and I was like, oh my goodness, where am I? So it was a little shocking and I’ve loved every second of it. CC: Look at you, havin’ this whirlwind. What has it been, three weeks, four weeks? RO: Four weeks with Thanksgiving in the middle. I got a couple days that I wasn’t here. But y’know, plant-based Thanksgiving. CC: (It seems like) that went by fast. RO: I know, it feels like yesterday for me, too, but I hope the relationship with PCRM and BMC is just beginning. Directed by Louie Psihoyos and executive produced by James Cameron, The Game Changers tells the story of James Wilks — elite special forces trainer and winner of The Ultimate Fighter — as he travels the world on a quest for the truth behind the world's most dangerous myth: that meat is necessary for protein, strength and optimal health. Meeting elite athletes, special ops soldiers, visionary scientists, cultural icons, and everyday heroes, what James discovers permanently changes his relationship with food and his definition of true strength. Dr. James Loomis, MD is a board certified internist who served as team physician for the St. Louis Rams and the St. Louis Cardinals. He is currently Medical Director at the Barnard Medical Center in Washington, D.C. and also serves on the clinical faculty of the department of internal medicine at Washington University School of Medicine. The Physicians Committee for Responsible Medicine is a nonprofit health organization that encourages higher standards for ethics and effectiveness in research and medical training. (The Physicians Committee for Responsible Medicine) identifies itself as a “Washington, D.C.-based nonprofit organization dedicated to promoting preventive medicine, especially better nutrition, and higher standards in research.” I disagree with that description. I consider PCRM to be a fanatical animal rights group with a clear cut agenda of promoting a vegan lifestyle and eliminating all animal experimentation. Based on PCRM's unprincipled 30-year relationship with my father, I'm with Dr. Joe. I'd welcome other examples. Please feel free to send via e-mail and I may add them to the list. The juxtaposition in the Nov. 15, 1993, issue of The Scientist -- Nobel laureate David Hubel's thoughtful essay regarding the threat to medical progress posed by the animal rights movement ("Animal Rights Movement Threatens Progress Of U.S. Medical Research," page 11) and the letter by antivivisectionist Neal Barnard (page 12) -- was interesting, to say the least. In his article, Hubel pointed out the ties between the terrorist Animal Liberation Front and the above-ground People for the Ethical Treatment of Animals. A January 1992 publication of the Office of Technology Assessment (Technology Against Terrorism: Structuring Security) links these groups with Barnard's own organization, the Physicians Committee for Responsible Medicine, whose views, the OTA report notes, appear "to have little support within the medical community" (page 27). The Physicians Committee for Responsible Medicine is an animal-rights organization posing as part of the establishment. The Physicians Committee for Responsible Medicine, a vegetarian and animal-rights group, wants the USDA to make meats and dairy products optional, offering green leafy vegetables and fruits in their places, particularly for some minorities. As can be seen on PCRM's own Web site, despite its name, fewer than 5 percent of PCRM's members have medical degrees. The group has a long history of opposing important research programs funded by respected health charities such as the American Heart Association, the March of Dimes, St. Jude Children's Research Hospital, the Susan G. Komen Breast Cancer Foundation and the American Cancer Society. PCRM opposes any use of laboratory animals in biomedical research, regardless of benefit. It was created in 1984 to provide a false patina of scientific credibilty to the extreme animal rights agenda espoused by PETA and other groups. Its involvement in animal rights activism remains strong. PCRM's president, Neal Barnard, is also president of the Foundation to Support Animal Protection, which is housed in PETA's headquarters in Norfolk. PETA founder Ingrid Newkirk is the foundation's vice president. According to IRS records, in 2000, the sole grant awarded by the foundation was to PCRM, in the amount of $432,524, nearly a fifth of PCRM's budget. It is unfortunate that your paper failed to give its readers the information they need to assess the credibility and motives of PCRM. Descended from a long line of cattle ranchers, Neal Barnard seems an unlikely advocate for animal rights. (Dr. Neal) Barnard is president of the Physicians Committee for Responsible Medicine, which wants to eliminate consumption of animal foods and end all animal research. He and the PCRM itself are closely aligned with the animal-rights group People for the Ethical Treatment of Animals, or PETA. Barnard was president of the PETA Foundation until recently. His books are advertised on PETA's Web site. The Physicians Committee for Responsible Medicine, led by Neal Barnard, MD, sounds like a bona fide independent and professional medical group. It turns out that less than 10 percent of PCRM member ship consists of physicians and that it receives funding from The Foundation to Support Animal Protection, an organization that evidently funds various charitable, educational, and scientific groups including PeTA and PCRM (Carmichael). "Responsible medicine" is code for an agenda promoting diets and medical practices not dependent on animals. An animal rights group is calling for a federal investigation of the University of Medicine and Dentistry of New Jersey's use of pigs. ...(The) Physicians Committee for Responsible Medicine says the use of the animals - which are put under anesthetized during the procedures and later killed - violates the Animal Welfare Act. Brookhaven National Laboratory employees were targets of a "robo call" campaign Thursday, sponsored by the animal-rights organization Physicians Committee for Responsible Medicine, which is protesting a proposed squirrel monkey experiment at the lab. The Physicians Committee for Responsible Medicine filed a petition for enforcement with the U.S. Department of Agriculture in October that accused the university and Donal O'Leary, Ph.D., of Animal Welfare Act violations. ...In the letter to the prosecutor's office, the animal rights group's director of academic affairs, Dr. John Pippin, and its associate general counsel, Mark Kennedy, allege that the university has violated the state law by "cruelly working hundreds of dogs, by forcing them to endure lengthy treadmill tests after multiple major surgeries." Enter the Physicians Committee for Responsible Medicine -- a nonprofit whose apolitical-sounding name belies the fact that it’s an animal rights group. ...The Physicians Committee for Responsible Medicine on Tuesday released a copy of a letter that it planned to send Wednesday to a U.S. Department of Agriculture official responsible for regulating animal welfare. The Physicians Committee for Responsible Medicine, a Washington-based physician group that focuses on animal rights, claims the former Medical College of Ohio’s use of pigs is unnecessary because other methods are available that don’t involve animals. The move leaves the University of Tennessee Health Science Center’s College of Medicine in Chattanooga as the last holdout among medical schools in the United States and Canada, according to the Physicians Committee for Responsible Medicine, an animal rights group that has waged a decade-long battle to stop the use of animals in training. Johns Hopkins is one of two accredited medical schools in North America that use animals in medical education, according to animal rights group the Physicians Committee for Responsible Medicine. The 15-second spot is slated to appear before each movie on all 10 screens of the Bel Air Luxury Cinema starting Friday -- the release date for the animated film “Finding Dory,” said officials with the Physicians Committee for Responsible Medicine. An animal-rights group on Thursday called for a federal investigation into the University of South Carolina’s use of live pigs in emergency medicine training. The Washington, D.C.,-based Physicians Committee for Responsible Medicine says the emergency medicine residency program, run by USC School of Medicine and Palmetto Health, violates the Animal Welfare Act by operating on pigs when alternatives are available. (The Physicians Committee for Responsible Medicine) is using billboards to call out Hennepin County Medical Center for using live animals to teach and train physicians in emergency medical procedural skills. The animal-rights group says the hospital should instead use simulators.